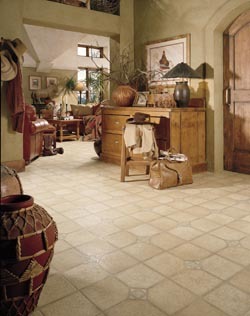 Come and browse the wide selection of vinyl flooring in Tacoma, WA, at our flooring store. The Floor Trader of Tacoma has what you are looking for when you are in the market for vinyl sheet flooring, vinyl floor tiles, or vinyl click flooring. This flooring option features a variety of beautiful, sturdy, and easy-to-maintain coverings that are going to look great in any room in your home or business. Create the look you have always dreamed about for your space with the help of our resilient vinyl flooring. Whether you want to enjoy the warm feeling of a hardwood floor or the nature-inspired elegance of slate, vinyl flooring is able to duplicate the look you are after while lowering the price and boosting the durability for you. When you first hear the words “vinyl flooring” you might not immediately think of the word “beauty.” When you first see the vinyl flooring available in our showroom, however, it will be one of the first words on your lips. That is because the advancements in flooring technology throughout the years has helped vinyl to become one of the most attractive flooring options on the market. When you have a vision for a home filled with hard-surface flooring options, you can begin to realize it while staying on budget with our vinyl sheet flooring and tiles. These flooring options give you the exact look you are after, the durability you need, and at the price point you want. It is also worth noting that vinyl is softer than much of the harder surfaces it is imitating, which means more comfort for you and your guests. How does having a vinyl floor make your life easier? Well, if you have ever spent an afternoon on your hands and knees trying to clean a stain off of the floor or repairing dents and scratches, then you can quickly see why not having to deal with those issues is a load off your plate. Vinyl flooring is all about giving you what you want while reducing the amount of effort you need to put into getting and maintaining it. This flooring option is affordable, it is effortless to clean and maintain, and it is strong enough to put up with most standard wear and tear. Just have our vinyl flooring installation team put it into your home for you, sit back, and relax. Contact us to learn more about the benefits of vinyl flooring for your home. Our store is ready to provide quality products and services to customers located throughout the Tacoma, Washington, area.